Gina Oliver, a first team All-American and two-time FIL World Cup gold medalist in her playing days, has raised the bar over her first two seasons as lacrosse coach at the University of Cincinnati, completing the most successful consecutive seasons in program history. In 2014, Oliver coached the Bearcats to six victories, including a program record five-game winning streak that saw the team receive votes in the Brine/Inside Lacrosse Media Poll for the first time ever. Five different Bearcats earned weekly honors from the BIG EAST Conference during the season, including Bell as Offensive Player of the Week and goalie Meg Gulmi as Defensive Player of the Week. Since then, the bearcats have had four Big East All Americans and 1 regional national all American, a first in bearcat history! Her debut season in Cincinnati saw the 2013 Bearcats match the program record with seven wins, highlighted by the school's first-ever BIG EAST victory over Rutgers to cap the season. Bell led the team in scoring, while Gulmi started every game as a rookie and averaged a league-best 8.88 saves per game. Last season (2017) marked the first Big East Wins in program history with 2 wins over Butler University & Vanderbilt University. Shannon Witzel is in her seventh season as assistant coach at the University of Cincinnati, helping the lacrosse program to the best consecutive seasons in school history. Prior to coming to UC, Witzel spent the 2012 season as an assistant coach at LaSalle, where she helped the Explorers to a 10-6 mark and set the program record for wins in a season. Witzel was also on the staff at LaSalle in 2009, before spending two years as a development assistant at her alma mater, Towson. Witzel's first coaching job was as a volunteer assistant for the Tigers, where she worked primarily with midfielders and defenders. That season, Towson won their conference title while earning a top-20 national ranking and a spot in the NCAA Tournament. 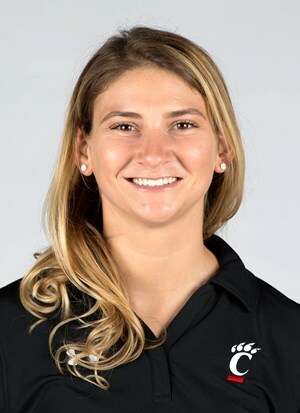 The 2019 season will mark the first on the coaching staff for Caitlin Prince, who joined the University of Cincinnati lacrosse program in August 2018 as an assistant coach. Prince, a former standout student-athlete at Duquesne, comes to Cincinnati after serving as an assistant coach at her alma mater the previous two years. Prince, who earned degrees in sociology and communications from DU in 2014, served as the assistant coach for the Dukes in the 2017 and 2018 seasons. Prior to that, she served as the assistant coach and recruiting coordinator at Robert Morris, fulfilling those rolls for the 2015 and 2016 seasons.